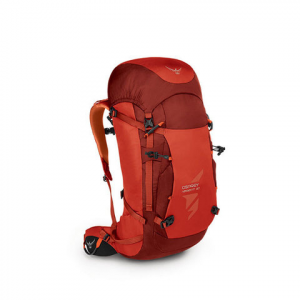 The Osprey Variant 37 Backpack is a pack that separates the serious climber from the mere rank and file--in fact, this is one the company designed specifically for the mountain guide, professional alpinist and weekend cragger. Everything on this backpack is dedicated to vertical pursuit, beginning with its special suspension system featuring a removable HDPE frame sheet with a 6061 aluminum stay for ultimate comfort and support throughout your climb. There are dual loops for downhill or cross country skis, a holster for an ice tool, and a compression pocket specially designed for crampons. The Osprey Variant 37 includes a 3-point system for big wall hauling, a water resistant front pocket, an under lid zipper pocket for storing maps, a wand pocket for keeping wands and pickets within easy reach and an extendible spindrift collar that keeps out the snow. The overall weight is reasonable for what this pack does--just 3 pounds 6 ounces--and the beauty is that it can be stripped down even more by removing the hip belt, top pocket and frame sheet, transforming the Variant 37 Backpack into a simple summit bag in the blink of an eye.